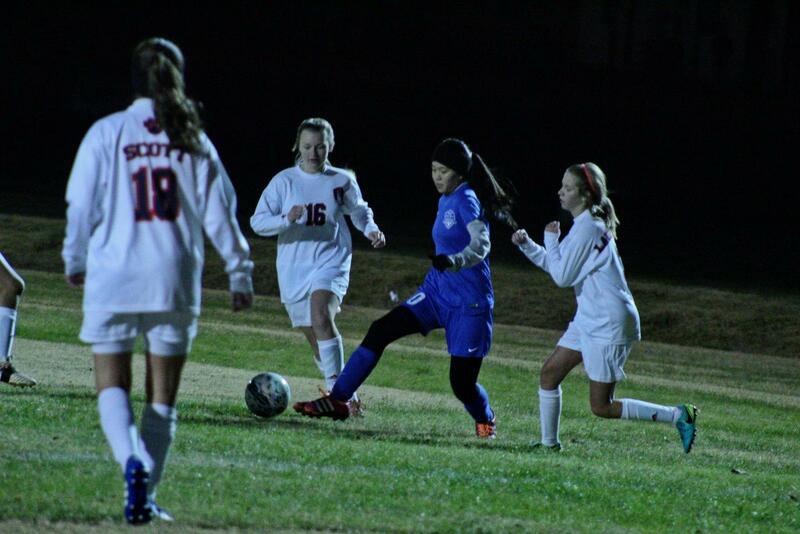 Grace Ann Beech fights the opposing team to maintain control of the ball. 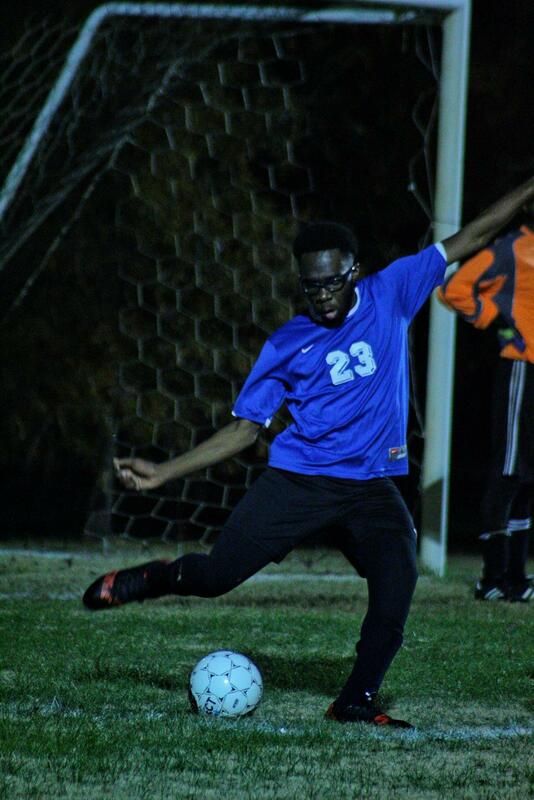 This past week, both of the soccer teams had the opportunity to compete in match-ups against the Nettleton High Tigers, the Lady Waves earning a draw 0-0, and the Blue Waves losing to the Tigers 4-0. The Lady Waves faced off against Nettleton and were evenly-matched. 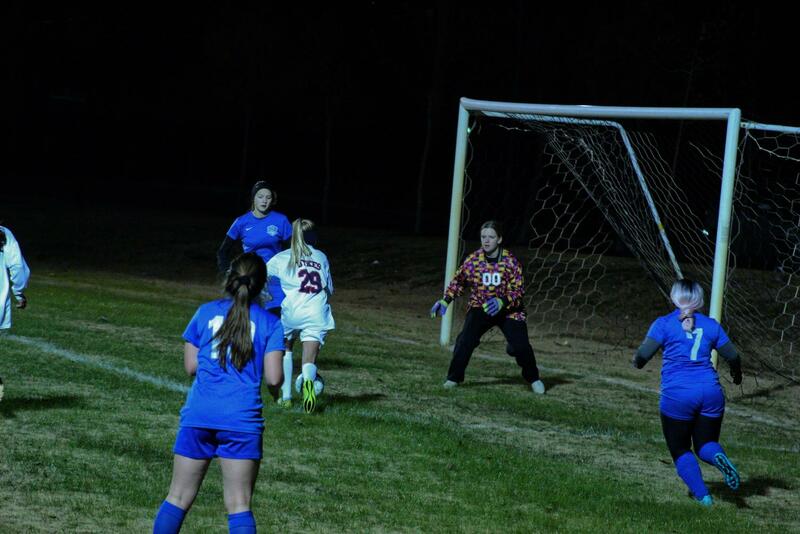 Several advances were made by forward Erin Davis being blocked by the opposing team’s goalie, and several attempts by the opposing side likewise being blocked by the Lady Wave’s defense. “Nettleton, by far, is the strongest team we’ve played, so it was great to practice for our district games that are rapidly approaching,” commented Team Captain and defensive player senior Madison Wypyski. Notably, one of the tactics the Lady Waves employed was very powerful, but controlled kicks, almost to the point of punts. Several of the Lady Waves were fairly spread out, the extra room giving them a chance to surprise the opposing team. When one player was being surrounded, they were able to send the ball far across the field to a teammate who was ready to intercept the long distance pass. Long distance passing aided them in their advances, and whenever the ball got back to the Lady Wave’s side of the field, it wasn’t very long before the Lady Waves’ offense had already returned to the Tigers’ side. The MSMS Lady Waves shoot a shot towards the Nettleton Tiger’s goal. Several shots were taken up the sides by Outside-Mid Grace Ann Beech, Coach Chuck Yarborough later praising the strategies by Beech at half-time. Also taking up the front lines were Erin Williams and Erin Davis, each winning the ball from aggressive stand-offs with the opposing teams. They each made several attempts and goal shots, but were blocked by the opposing goalie numerous times. 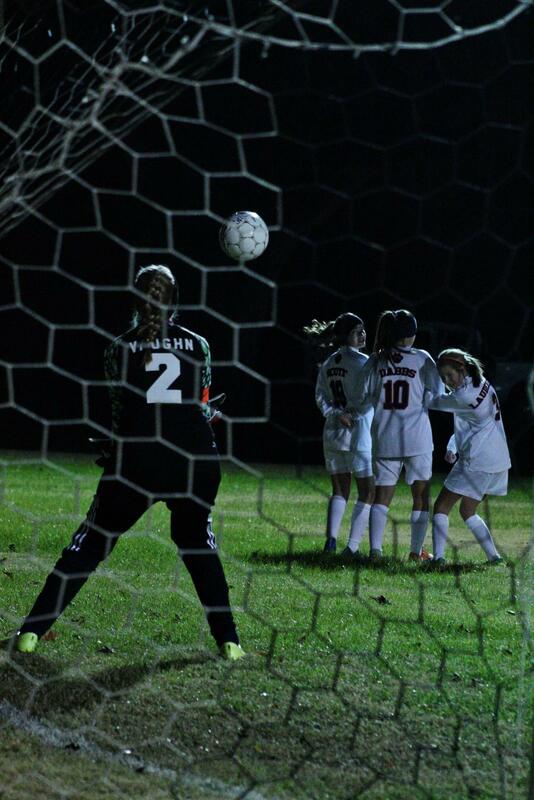 “We’ll be working to hammer out some of those rough spots (finishing the ball into the goal) before we enter District play at Philadelphia,” Coach Yarborough stated regarding the girl’s offensive plays. Close to only 20 minutes into the game, the score still 0-0, several fouls were called on MSMS, much to the confusion of both Coach Yarborough and the Lady Waves players on the sideline who couldn’t find a legitimate reason that the whistles were blown. Despite this, the Lady Waves kept their cool and continued to make plays down the field, relying on their teammates and formation to continue pushing through. “This was definitely a more organized team effort than our match prior to the break,” Coach Yarborough continued. He also remarked how Madison, Zariah Wright, Erin and Catherine Li jelled together as a unit, a result of all the team in general as this was this chance to further their team bonding and chemistry. Catherine Li makes an advance while being surrounded on three sides. The advances continued to ping-pong between both teams until the end of the game. However, this tie isn’t something to be upset about. “I am proud of the way the Lady Waves played Tuesday evening. We definitely have a lot of work to do, developing as both individual players and as a team. I think (this game) highlighted how far we have come as a team,” Wypyski concluded. The Men’s Blue Waves team also faced off against the Nettleton Tigers the same night, although to different results. The Blue Waves lost 4-0. One of the overall problems with the plays and strategies of the Blue Waves was that they just weren’t as communicative as the Tigers, or able to maintain their formation as efficiently. When trying to move the ball up-field, the Tigers were often able to sweep it off the Blue Waves feet and advance it straight back. Another common problem seemed to be the lack of aggression towards the ball both offensively and defensively, as there didn’t seem to be too many attempts to challenge the opposing team’s players who were in possession of the ball. 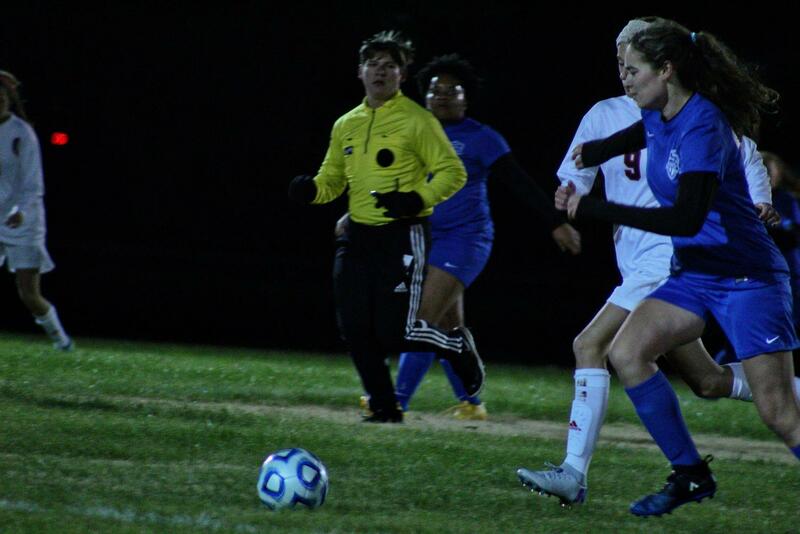 This common trend applied for the majority of the game, and despite respectable attempts from the Blue Waves’ defense, several shots made their way into the MSMS goal. Keeper Advaith Sunil tried his best to defend the goal, but goal shot after goal shot and the Blue Waves couldn’t keep up. Keeper, senior Advaith Sunil caught several of the attempts made by the opposing team and helped push forward the Blue Waves team onto the Tigers’ side of the field, but it wasn’t very long before he was having to block shots left and right, having little time to recover before the next shot was sent his way. Eventually the score dropped to 1-and-0, then to 2-and-0, then dropping two more points due to the offensive capabilities of the Tigers. “The game was a humbling experience,” Captain Morgan Emokpae remarked. His advice was soon followed by pointers for where the Blue Waves could improve their defensive and offensive strategies and make-up lost ground. The team itself was quick to analyze their problems from the first half, and put plan into practice for the second half. Morgan Empokpae kicks the ball to a teammate. While they were improved in communication and formation, advancing further up the field than before and blocking advances by the other time more effectively, it still was not enough to change the overall score. Some notable advances were made by Jaylen Hopson and Devin Chen. At the end of the game, the Blue Waves took their defeat as a lesson. Later during practice the rest of the week, the team focused on improving the aspects that went wrong during the game and preparing for the District game against Philadelphia. 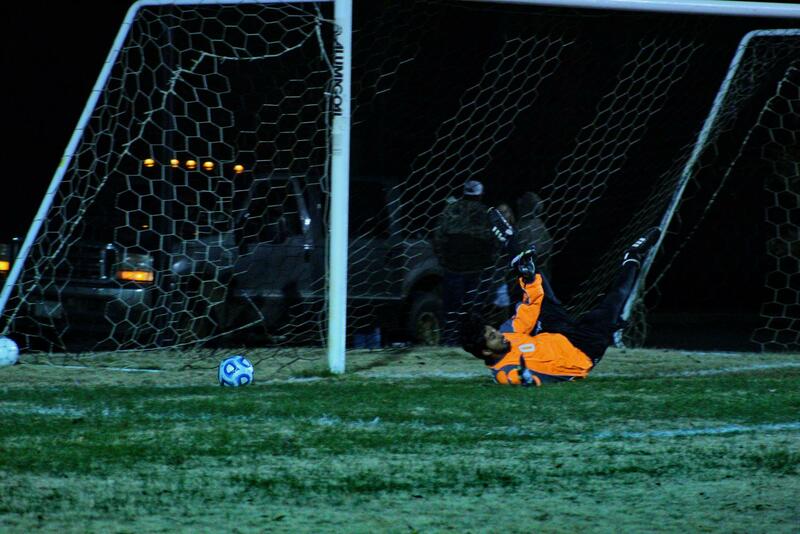 “While we lost 4-0, (the game) was a chance to build and improve against a good Nettleton squad. We’ll keep working to develop our team work as we head into important District matches,” concluded Coach Morri Mims.